Fitok oil field components are offered for standard oil field service where H2S is present the type “S” is offered. Fitok’s “S” components are manufactured with materials and procedures specified for optimum resistance to H2S. These material specifications and manufacturing procedures are continually updated to incorporate the latest advances and changes to NACE MR0175 compliance. Fitok type “S” valves and fittings can be supplied with standard API threaded test and gauge connections. 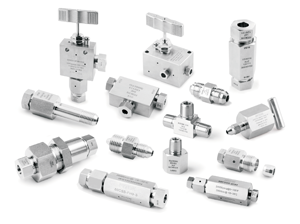 As well as coned and threaded connections such as Medium Pressure (MP) and High Pressure (HP).